Have you ever remembered you need to post on Instagram… but felt totally stuck? Want ALL the future Instagram recipes? Just so you know… We’re only posting a few of these episodes on our blog, so make sure to subscribe separately below if you want the rest. In just a few minutes, you’ll create and post a fun and engaging Instagram post that will attract more Instagram likes, comments, and followers. Today you’ll do this by revealing to your followers a quick glimpse inside your world – they’re going to love it! The best part? You can use this post type even if you’re camera shy and by using items you already have sitting around your home, office or favorite coffee shop. Step 1. Grab something that fits comfortably in your hand, and put it front and center in your photo. Step 3. Find a clean, uncluttered background with plenty of soft, even lighting. Step 4. Snap your photo! Step 5. Craft your caption. Need inspiration to write a caption that connects with followers? Try this little formula we call “React & Ask”. First, look at your photo and think through how it makes you feel. Go with the first reaction that pops into your head: Surprised? Excited? Nostalgic? Thankful? Any reaction that feels genuine to you will work. Next, expand that feeling into a sentence. Don’t worry about sounding “polished” — just write the way you talk! Finally, finish your caption by adding a question for your followers to respond to in the comments. That’s it! Not too bad, huh? You may think, “This seems… easy.” And you’re 100% right! 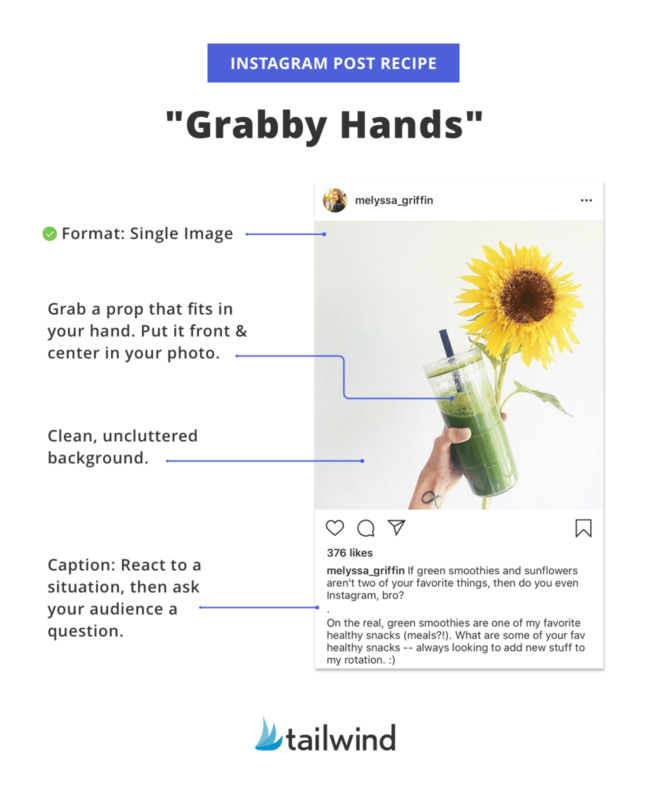 But that doesn’t stop this simple template from driving serious engagement for top-performing Instagram accounts across the board. Want to see how the pros get hands-on to make their photos pop? Let’s take a deeper look together. Bright. Clean. Simple. This photo checks all the right boxes and feels like a breath of fresh air! You’ve got to love the bright colors and clean, white background. It practically glows with friendliness and warmth! Notice the lighting: Isn’t it even and consistent? No harsh shadows here! Consider locating your photo near a window if your first try seems dark, grainy, or shadowy. The tattoo adds a personal touch. It’s uniquely important to Melyssa — and you know beyond doubt that it’s really her hand. This photo is simple, but fun! It helps your followers feel grounded “in the moment” alongside you. Just seeing her holding her matching mouse ears out — it feels like you’re really there too. Notice the short and uncomplicated caption. Don’t overthink it and have fun! It seems likely that someone else is holding this cup. So, don’t be afraid to ask a friend (or your barista) to help you get a quick photo! Know what your audience loves — and who they aspire to become. This photo plays on a common habit of entrepreneurs (drinking coffee) and a commonly held dream (becoming a side hustler). Ask yourself before posting: What habits does your audience engage in constantly? What kind of person do they hope to become one day — and can you encourage or help them along their journey? Wasn’t that easy? Now, you’re fully equipped to fill-up your Instagram feed with anything within arm’s reach that’s beautiful, personal, or just plain fascinating. Pull from the examples above to fuel your own creativity as you experiment with applying the “Grabby Hands” post recipe to your own knick-knacks, books, accessories, or drink of choice. Follow it up with a simple but thoughtful caption and schedule it to go out at the best time for engagement (hint: use Tailwind for this!). Matt helps make world-class marketing easier for everyone as Tailwind’s inbound marketer. He’s admittedly crazy about craft coffee and top-notch podcasts, too. Feedback welcome @matopher on Twitter! This is very helpful, and I’ve noticed I get great engagement when I implement this move into my strategy. That’s great to hear. Thanks for your note. 🙂 Also, for the smile I got from reading your name. Ha. That’s amazing to hear! 🙌🏻 I’d love to see your examples too.